In the Canton provinces of China, many people gather at tea houses during the morning and early afternoon to socialize or conduct business over small meals. In China this is most popularly called going to yum cha -- going to tea -- because the drinking of tea is so strongly associated with the snack foods served. In the United States, however, we are most familiar with the term dim sum to describe these small meals. Dim sum, literally translated from the Cantonese, means "dot-hearts," small treats that touch the heart. 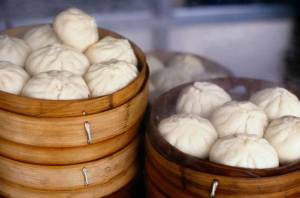 Most dim sum foods are savory pastries -- steamed or fried dumplings, filled buns, noodles. There are also sweet pastries, vegetables, meats. The portions are bite-sized, and they are served in small quantities, usually three or four to a plate, so that the diners can enjoy a variety of foods, whether they eat very little or indulge in a huge feast. Variety is one of the keys to dim sum. Some restaurants offer over 100 different items on a busy day. The presentation of the dim sum meal has no equivalent in the West. Servers push carts, loaded with a variety of foods, through the dining room, past the customers, who keep an eye out for appealing dishes. Once a desired item is in sight, the diner flags down the cart and points out what she wants. The dining room bustles with the activity of carts wending among tables, calls for attention, and the clatter of plates. The idea is to choose things continually throughout the meal, rather than to gather all the food at once before eating. Sweet items are interspersed with the savories; Chinese custom does not include saving sweets for the end of the meal, although they are reserved for special occasions, such as the pauses between courses in a banquet or indulgences like dim sum. Just as the arrival of food is ongoing, the supply of tea is endless. When a teapot is empty, the customer need only leave the lid up, and it will be whisked away and refilled. One story told to explain this custom involves a poor student who hid a bird in his teapot. When the waiter came to refill the pot and lifted the lid, the bird flew away. According to his plan, the student made a loud fuss. It was a very valuable bird, he said, and the restaurant owed him recompense. After this, the restaurant-and all others--decided to wait for customers to lift the lid of an empty teapot if a refill was needed. When the diners have eaten their fill, the bill is calculated by counting up the number of plates on the table. Baked or steamed, these fluffy buns are filled with different meats and vegetables. The most popular type is char siu bao, a bun with barbeque-flavored pork meat and onions inside. It can be either steamed to be fluffy and white or baked with a light sugar glaze to produce a smooth golden-brown crust. This recipe is for steamed char siu bao. In a small bowl combine yeast with 2 tablespoons warm water, 1 teaspoon sugar and 1 teaspoon all-purpose flour. Mix until well combined. Cover with a kitchen towel and let stand in a warm place until frothy, about 15 minutes. Sift remaining all-purpose and self-rising flour into a large bowl. Add remaining sugar, yeast mixture, remaining warm water, and melted butter. Using a wooden spoon, mix to form a soft dough. Turn out onto a floured work surface and knead until smooth and elastic, 3-5 minutes. Place dough in a large oiled bowl, cover and let stand in a warm place until doubled in bulk, about 1 hour. Heat oil in a wok or frying pan over medium heat and fry ginger and garlic until aromatic, about 1 minute. Add hoisin sauce, oyster sauce, soy sauce and sesame oil. Cook, stirring, for 2 minutes. Add the cornstarch and water mixture, bring to a boil and stir until sauce thickens, about 2 minutes. Remove from heat and stir in pork and scallions. Transfer to a bowl and allow to cool completely. Punch down dough. Turn out onto a floured work surface and knead until smooth, about 5 minutes. Divide dough into 16 pieces and roll or press out each piece to form a 21/4-inch (6-cm) circle. Cover dough with a damp kitchen towel. Working with one round of dough at a time, spoon 2 teaspoons of filling into the center. Gather edges together, twist to seal and cover with a kitchen towel. Repeat with remaining dough. Cut out 16 squares of parchment (baking paper) and place buns, sealed side down, on paper. Half fill a medium wok with water (steamer should not touch water) and bring to a boil. Working in batches, arrange buns in steamer, cover and place steamer over boiling water. Steam for 15 minutes, adding more boiling water to wok when necessary. Lift steamer off wok and carefully remove buns. Using scissors, snip the top of each bun twice, to resemble a star. Serve warm with soy sauce and hoisin sauce. Frankly, I have yet to try this recipe. Just want to inform Joleen that baked charsiew bao is known as charsiew sou in singapore. Please dont disgrace us. Charsiew bao is not served with hoisin sauce nor soy sauce. I have not seen a baked charsiew bao thus far. No it's not called charsiew sou in Singapore. It's called Do Do Mao Bao. Char Siu Sou is the variety made with puff pastry - completely different to Char Siu Bao (whether steamed or baked). Whatever it is called, it's yummy. I love it steamed. In our country its called siopao. WOW! I red these replys to find out how the recipe was, not to hear a bunch of Asians WHINE about WHAT TO CALL IT! I CALL IT FOOD. Whatever name you call these buns, they all mean delicious; steamed or baked heaven.